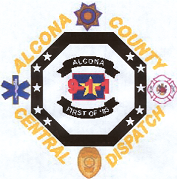 Alcona County Central Dispatch is a consolidated emergency services answering point, responsible for handling requests for law enforcement, fire and emergency medical services for Alcona County. We are located within the Sheriff’s Department just west of the intersection of M-72 and US 23 in Harrisville. Our Staff consists of a Director, and 8 dispatchers. 1. Call only for immediate emergency assistance: medical, fire or police. 2. Be prepared to provide essential information to the dispatcher. 3. Stay on the line until you are told to hang up. 3. Do Not Hang Up on an Accidental 911 Call-Tell the Dispatcher that it was an Accident. 1. “Landline Phones” are phones that ring in your home. 2. Most Landline Phones will provide the 911 Dispatcher with your address. The dispatcher will verify your address if you call 911. 3. Cell Phones do not provide your location to the dispatcher. 4. If you call 911 from a Cell Phone-be patient. The call may not go to the proper agency and may have to be transferred. 5. Cell Phone callers should use caution when calling from a vehicle. Look for landmarks/street names/or mile markers to give your location. 6. Stay on the line until the Dispatcher has all the information. 7. Leave your phone ON in case they need to call you back. 8. Keep in mind that lack of cell phone coverage may prevent you from getting a good signal to call 911. You may have to change your location to make your call. STAY CALM AND HELP THE DISPATCHER GET THE RIGHT INFORMATION SO THEY CAN GET YOU THE HELP YOU NEED. DON’T HANG UP. LET THE DISPATCHER END THE CALL.